Extremely soft and cozy! Love the color! Our motto when it comes to Me Sooo Comfy is to "B Plush." You'll never reach for another blanket once you've felt the soft plush comfort of this bedding. This thick coral fleece blanket is oversized to give you the inches you need to cozy up on the couch or in bed at night. 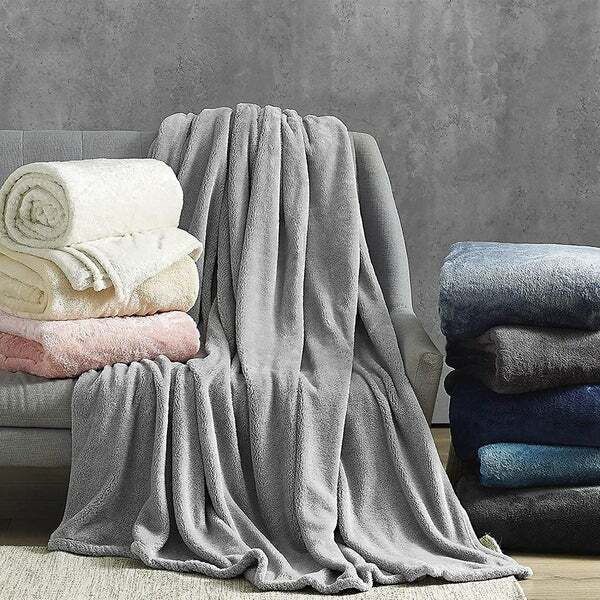 Whether you're lounging at home, at your college dorm, or setting in at your apartment you'll want our Me Sooo Comfy Bedding Blanket waiting for you! The 'Me Sooo Comfy' Bedding Blanket is luxuriously soft and comfortable and will feel heavenly after a long day. Made of incredibly soft coral fleece with thick 250 GSM Fabric Weight, you won't be able to resist this blanket. Farmhouse White, Glacier Gray, Faded Black, Smoke Blue, Nightfall Navy, Tan, or Black options. I got my blanket yesterday and it was all I thought it would be and more!!!! It is soooooo soft, comfy, warm, snuggly and plush!!!! I can't stop touching it!!!! My little one wouldn't stop touching it either. Needless to say he slept with Mommie on my new sooo soft blanket!!! Of course he wants one, so I am going to make several more purchases. This blanket is worth every penny!!! This blanket is a joke! I purchased an XL twin size for the bed of my son and yes, it is long. This is the only reason why it gets one star. This blanket is a waste of your money!!! It is expensive because it is thin, and not wide enough to cover the bed. I mean, are you serious?!!! they should advertise this blanket as a throw for when you watch tv or something, but not for the bed, it is NOT wide enough ....and if they did, well, I definitely miss that part. I would not recommend this blanket at all! I purchased one blanket for 20 dollars at ****, it is thicker, better quality and overall a better blanket than this piece of junk! I ordered this so soft blanket in king size black and it is amazing, its big enough and it goes over the sides of the bed, I washed it already and it hasn't faded or fallen apart, I will order 2 twin size for my 2 year old twins, they too love the softness of this blanket, I wish it came in a large range of colors. Really is Sooo Comfy! I purchased this blanket in black, which isn't an easy color to find. I am super happy with the purchase considering it was driven by color alone. Would definitely buy again! This is a yummy blanket. It fits a queen bed perfectly. It is true to color and oh so soft. I will definitely purchase this in other colors. I'm always on the lookout for comfy blankets so when I came across it here, I had to order it. It arrived today in the mail and the first thing I did was to poke my hand into the packaging to feel the blanket. It's probably the softest blanket I've ever felt. I can't wait to put it on my bed. I deducted a star because I haven't had a chance to test it out in its full capacity yet. I purchased the cream colored blanket by Byourbed and would buy another if needed. It’s plush, soft and weighs practically nothing but it really keeps you warm at night. This blanket is exactly how it states, super comfy. Due to the cold snap in Indy I had just put it on the bed. 1 night with it on, my Daughter visiting from College has already claimed it. Looks like I will be ordering more! I ordered this blanket and I must say it was shipped out fast and I got it in 3 days. The description on this blanket is everything it says. It is soft comfy and it sure keeps you warm and sure to last a long time. Thanks overstock. Very soft nice blanket. Perfect gift. very pleased with this purchase. the blanket is ultra soft for my son's bed and he really enjoys crawling in at night. Blanket is extremely soft and warm. But slides down to the door of the bed during the night. "Which color is which, it makes me sooo angry on most of these items there is no guides to what color is the one I am looking at! No way do I want to spent the winter season buying and sending them back because the color to the product was not listed!" I have sent a request to have the images labeled with their color names. loved the color and read the reviews. i was looking for a warm blanket! They are Xmas gifts. Softness and price are my reasons for purchase. I am not sure about the color "tan" yet. I hope it is cream in color. "I'm looking for a lightweight blanket to use on the bed for summer. Warm, but not too warm. Will this blanket meet those criteria?" This should be a good go-to blanket on summer nights.